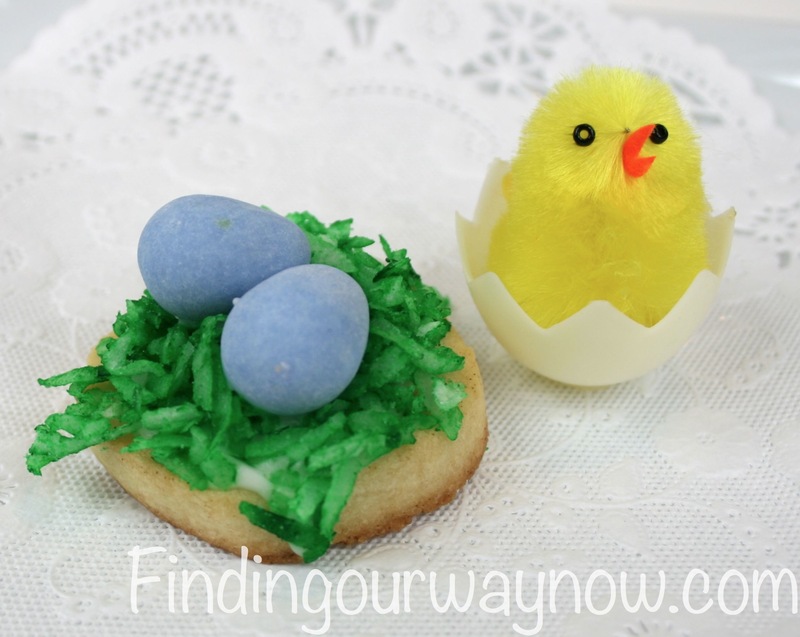 These Birds Nest and Flower Easter Cookies are yummy and even more fun to make. Spring offers much inspiration for me, especially in the kitchen. For me, it has to do with the flowers, critters, and bright colors. I had an idea, so I decided to see if it would work. 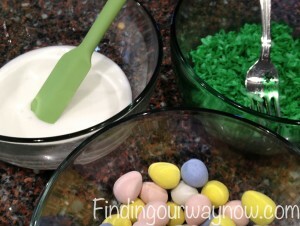 I had a friend over to help, we had an absolute blast making these Birds Nest and Flower Easter Cookies. We loved the outcome, and so will you. Making cookies from scratch is never hard. It just takes a little assembly of a few ingredients. 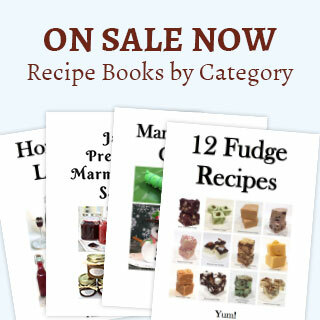 The cookie recipe comes from Mark Bittman’s cookbook, “The Basics” one of my favorites “go to” cookbooks. The rest is of my making. Line two baking sheet with Silpat or parchment and set aside. Using an electric mixer, cream the cup of softened butter and sugar until light and fluffy. Then add the egg and vanilla and beat until thoroughly blended. Combine the flour, baking powder, and salt in a medium bowl. Add the dry ingredients to the butter-sugar mixture. Beat for a few seconds, and then pinch the dough to see if it holds together easily. If not, add a tablespoon of milk at a time, beating and stopping to pinch the dough after each addition. Once the desired consistency is achieved, divide the dough in half. Shape each piece into a log about 2 inches in diameter by rolling it on a flat surface. Wrap each roll in plastic wrap and refrigerate for at least 2 hours up to 2 days. (You may also wrap the dough tightly in plastic and freeze indefinitely). Before baking the cookies, assemble the cookie decorations, prepare the cookie icing and green coconut and set aside for nest assembly. In a small bowl, combined the coconut with green food coloring with a fork until you’ve reached the color of green you desire. Mix powdered sugar and milk (a little at a time) until you’ve reached the consistency of thick corn syrup. If needed adjust the sugar and the milk until the desired consistency is achieved. Heat oven to 375° F. Cut each roll crosswise with a chef’s knife into slices ¼ to ⅛ inch thick. Put cookies on the prepared baking sheets leaving about 1 inch of space between each cookie. 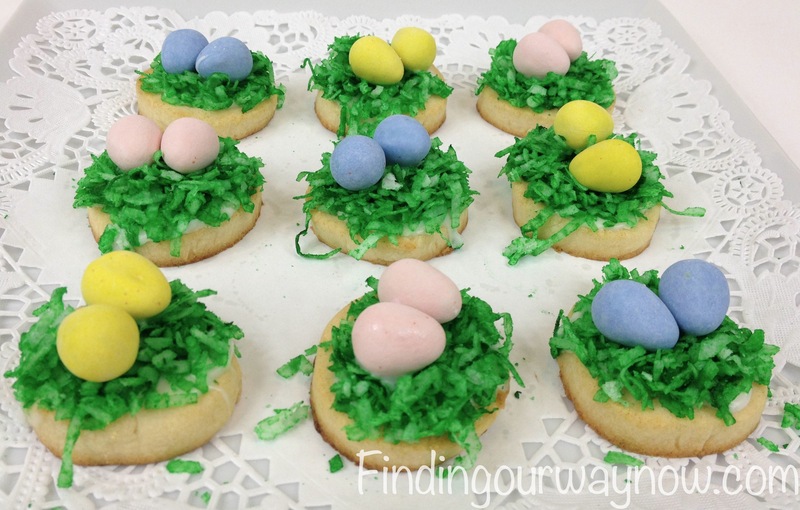 Bake the cookies for 9-10 minutes, until the edges are light browned and set in the center. Cool for about 2 minutes on the sheets; then transfer the cookies to a rack with a spatula to finish cooling. For Birds Nests: Spread a small amount of cookie icing on the top of each cookie then place a small amount of green coconut on top of the icing pressing lightly to adhere to the cookie. Add a dab of frosting to act like glue on the bottom of two candy coated eggs and place them in the center of the coconut-topped cookies. 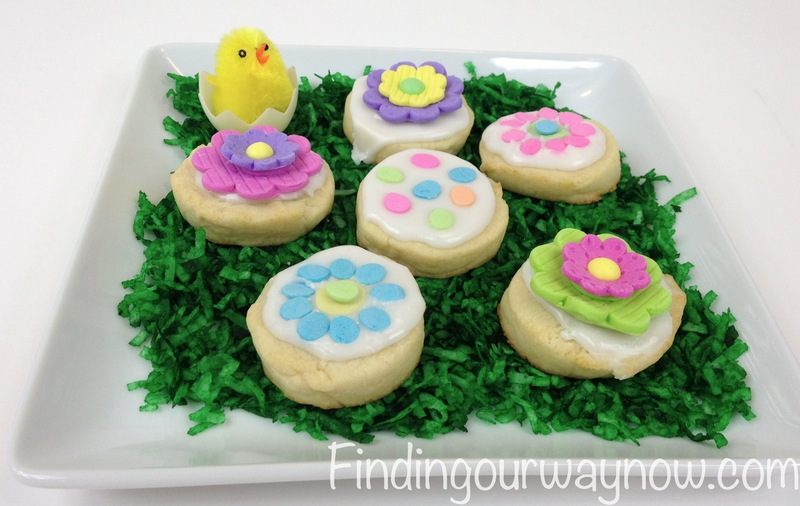 For Flower or Decorated Cookies: Spread a small amount of cookie icing on the top of each cookie and place the sprinkles or sugar cookie decorations or fondant flowers in the desired location. 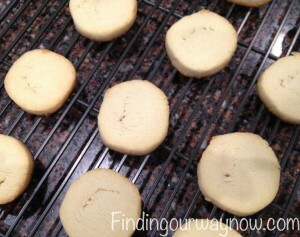 Store the cookies in an airtight container in the refrigerator for up to 5 days. Notes: Watch the cookies while baking to ensure you don’t overbake them. I start at 8 minutes and add to the baking time as needed. Make sure the cookie frosting isn’t too thin. If it is, just add a bit more sugar to thicken it. We made extra green coconut for later use as a decorative base for serving the cookies. The green coconut stores well in Ziploc bag or sealed container in the refrigerator. Now, why not get that mixer out and has some fun with these Birds Nest and Flower Easter Cookies. The best part is you can be as creative as you desire and then eat the results. The point is to have fun with this. What’s not to like about that? Enjoy.